Pizza and dessert just met and it was spectacular. 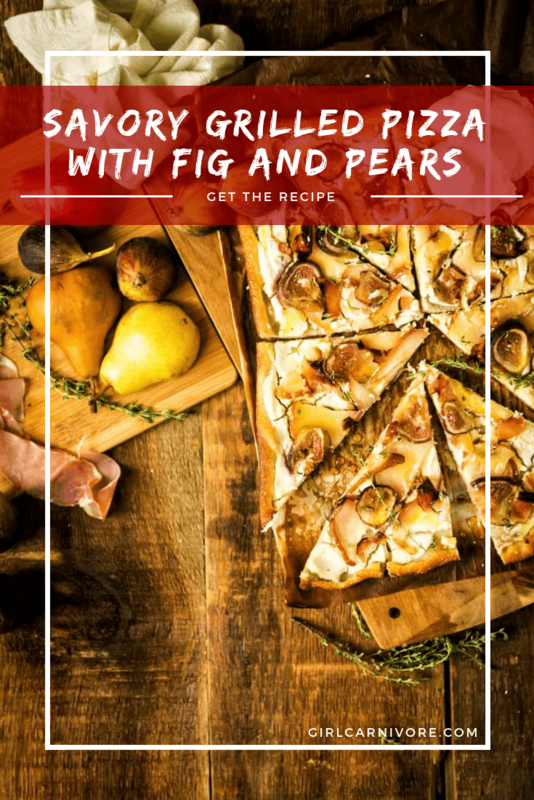 The flavor combo in this Savory Grilled Pizza with Fig and Pears Recipe is one you will be making over and over! We all know grilled pizza is just about the best pizza ever. There’s something about the high heat and subtle smoke that brings out the best in the flavors and produced the crispy perfect crust we all crave. 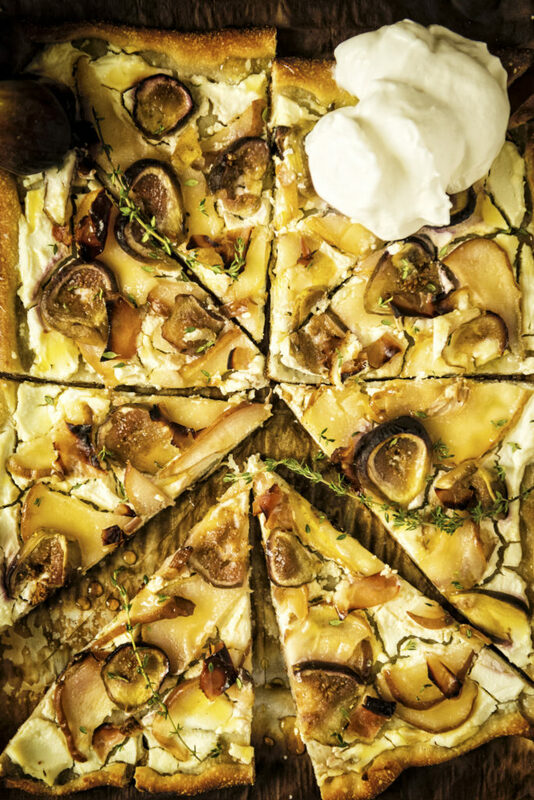 So why not use the abundance of fall flavors to create an amazing dessert style pizza with some traditional GirlCarnivore flair. What’s great about grilling pizza is that its fun, and comes together quickly in your own back-yard. Hell, it’s faster than waiting for the delivery driver and you know it’s going to arrive on your plate just how you want it. 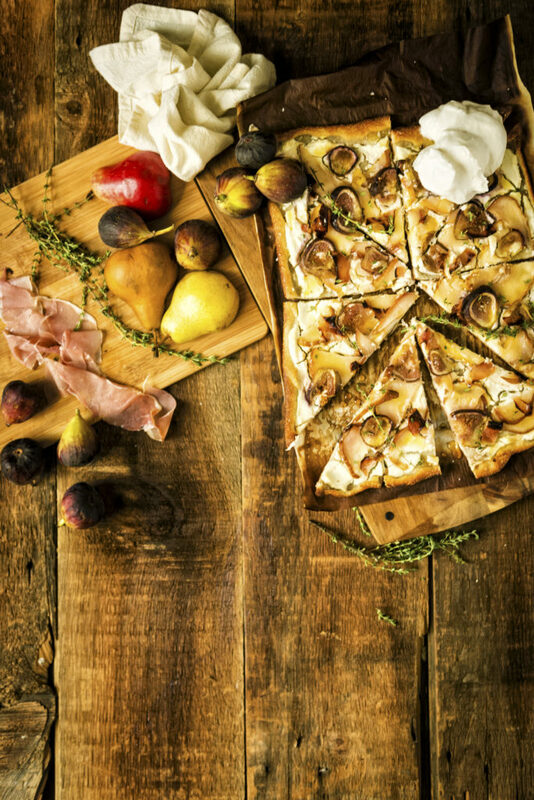 By using fresh figs and pears, we turn pizza into a dessert. Adding bits of prosciutto, thyme, and smoked sea salt keep it from settling too hard on your sweet tooth. This bourbon whipped cream on top makes this an adults only party. And that’s ok because the flavors are for a pretty mature appetite anyway. 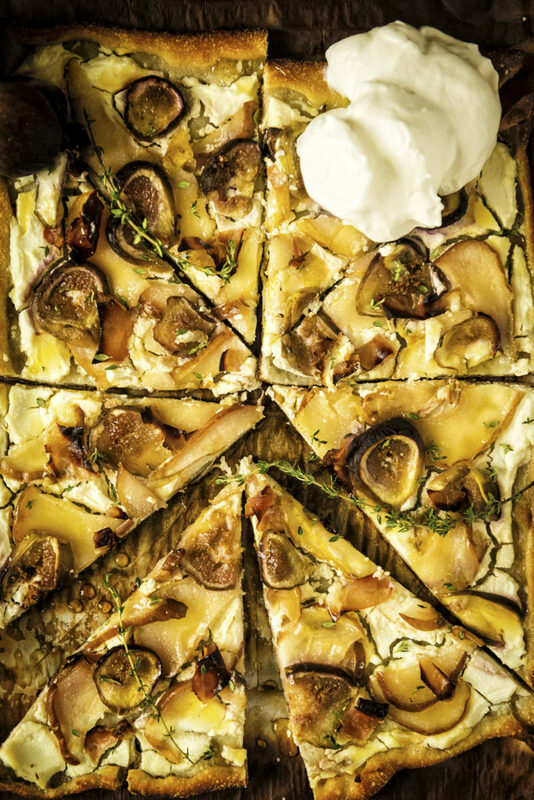 Round one can be killer classic grilled pizzas (or get creative with some others), but make sure you finish your next pizza party strong with this over the top savory grilled pizza with figs and pears. Get your grill really hot. Crisp pizza crust comes from a hot grill, so turn up the heat! Have all of your toppings ready to go. When making grilled pizzas, things move quick, so having all of your toppings ready to go ahead of time is the perfect strategy for success. Have tools to help. Invest in an inexpensive pizza wheel or use a cookie sheet and tongs for quick and safe transfers of hot pizzas. Handling the uncooked dough can be cumbersome. And getting the finished pizza away from the hot grill can be tricky. So make sure to arm yourself with tools to help prevent injuries. Have fun with it. Embrace that your dough may not look perfectly round or that your grill may have a hot spot and you scorched a corner. It’s pizza. It’s fun. And you should be having some while making these! If you’ve tried my Savory Grilled Pizza with Figs and Pears recipe or any other recipe on GirlCarnivore.com please don’t forget to rate the recipe and let me know where you found it in the comments below. I get inspired by your feedback and comments! You can also FOLLOW ME on Instagram @girlcarnivore as well as on Twitter and Facebook. Preheat grill, so that it's nice and hot. Crisp pizza dough happens over high heat. If your grill can get to 500 degrees F, this is perfect. Sautee the pears in the butter and brown sugar until just softened, about 5 minutes. Set aside to cool. On a clean work, surface sprinkled with cornmeal, roll out the pizza dough, working one at a time. In a large bowl, whip the ricotta with a dash of salt and pepper, and the heavy cream until light and fluffy. Spread half evenly over the dough. 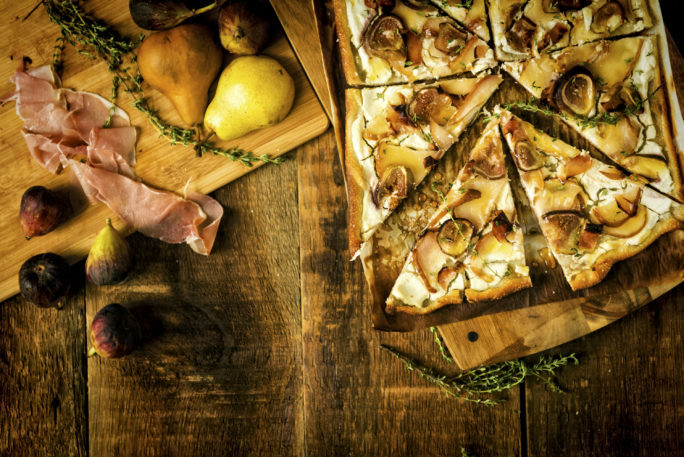 Top the whipped ricotta with the sauteed pears, sliced figs, and strips of prosciutto. Using your fingers, scrape the leaves from the sprigs of thyme and sprinkle over the pizza. Grill until the crust is cooked through and is crispy, rotating with a pizza wheel if needed for even cooking throughout. Allow to cool 3 to 5 minutes before slicing to serve. To serve, drizzle with fresh honey and a dollop of the bourbon whipped cream. In a the bowl of your stand mixer, fitted with the paddle attachment, whip the heavy cream on high 2 minutes until just doubled in size. Gently, add in the sugar and bourbon, increasing the speed to form moist but solid peaks. Place in the refrigerator to keep cold until ready to use. If serving Bourbon whipped cream with the pizza, be sure to allow the pizza to cool a full 5 to 7 minutes before topping as the heat of the pizza will quickly melt the whipped cream. Dollop over the pizza and sprinkle with smoked sea salt for added flavor. Wow, This pizza sounds so good. Thank you for adding the grilling tips, I’ve never had good luck with grilled pizza. Oh my goodness, this looks so good! I gotta say though, I’ve never tried a grilled pizza before but I love anything that’s grilled so this is definitely worth a shot! Thank you so much for sharing. Dang I love fruit and fancy cheeses on pizza, especially more when it’s grilled!